The GreyLink greywater irrigation system provides remote smartphone and PC programming for greywater and non-greywater irrigation zones as well as greywater processor monitoring, flow reporting and automatic inflow diversion to the sewer during rainfall. The Flotender greywater irrigation system features an instant release greywater processor which is automatically activated shortly after receiving inflowing greywater. The GL and GXL series models are also available with optional multi-zone programming for landscapes needing greywater and / or non-greywater zone scheduling. Full featured irrigation systems specifically designed for greywater reuse. 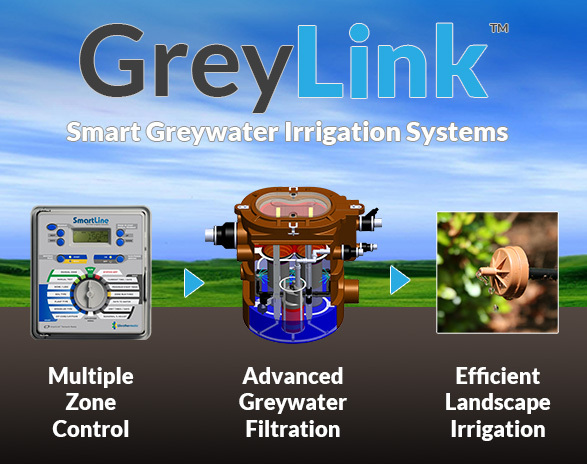 The GreyLink Greywater Irrigation System utilizes greywater produced from greywater sources such as showers, sinks and washing machines for landscape irrigation. GreyLink provides 150 mesh, dual stage filtration to remove particulates from the greywater prior to irrigation. In addition to mechanical filtration, ozone and ultraviolet treatment options are also available. Weathermatic's line of smart controllers provide advanced system control water usage reporting for the full-featured irrigation system. Is your project a little outside of the box? GreyLink Systems are fully customizable to fit the requirements of your project.